Sometimes finding stuff at the thrift store is like a furniture famine. Everyone is afraid that they won’t find something good, so when they spot it, they snap it up so quickly. That’s what I did with this kid’s chair. I was walking down the aisle and nearly the same time that someone else stopped in front of this chair, I said, “Wow, this is so cute! And it’s only $5.00!” Some woman was like “OMG, yeah!” as if she were about to buy it if I didn’t. So I quickly loaded it in my car, with a cat-eating grin on my face. I knew I had scored something great! But after slathering on Annie Sloan chalk paint in Aubusson blue, with white accents, and a chalkboard on top, this piece was AH-mazing! The blue was so crisp against the white. It looks expensive, doesn’t it?! Little does anyone know it was only $5.00 :). 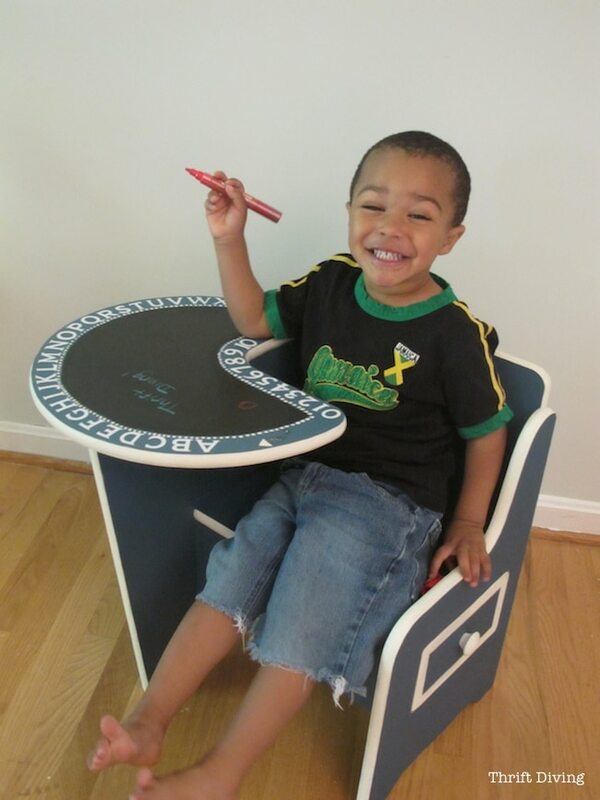 I really wanted a place where my boys could sit and learn their ABCs and practice on the chalkboard. I used a sheet of stickers and cute places them along the edge, then sealed with Annie Sloan clear wax so they didn’t come off. 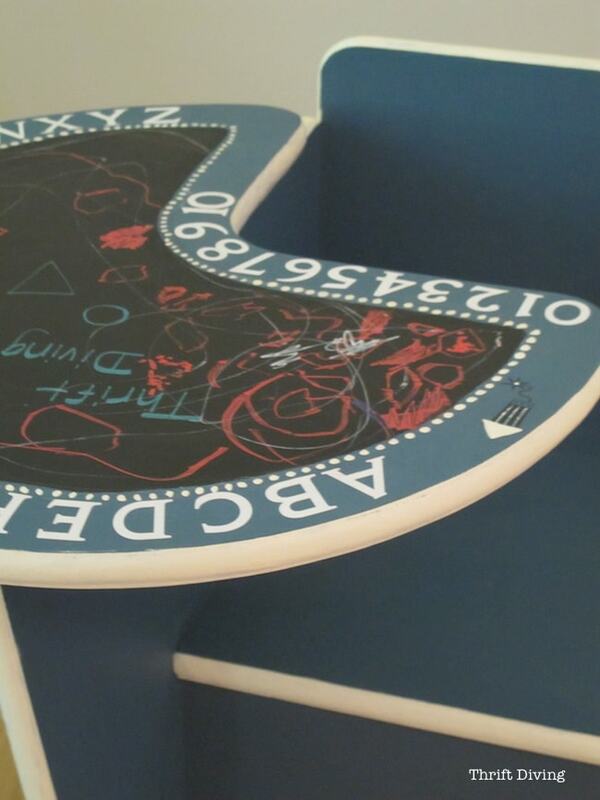 The drawer on the side was perfect for chalk! And I wanted to draw attention to the drawer so I created a white square around the edge. Love that! There’s tons of storage for my smaller boys to keep all their chalk! 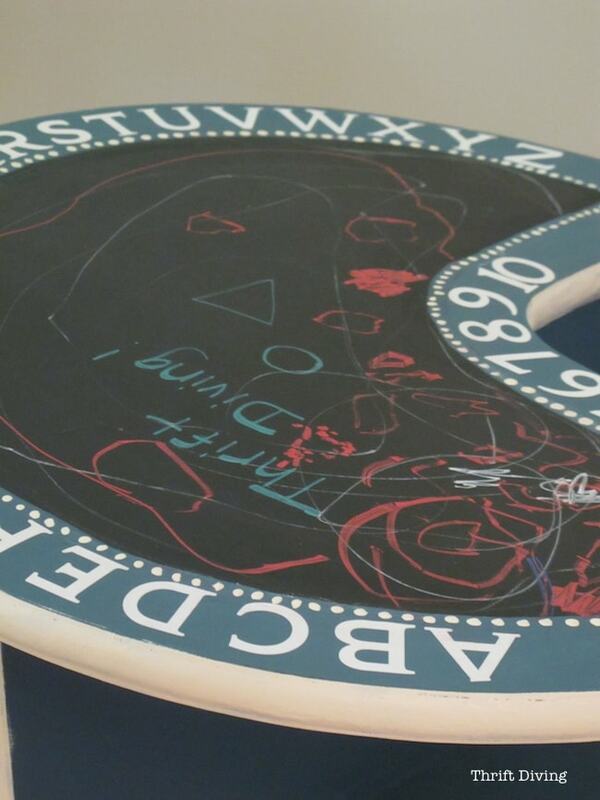 Adding a chalkboard to the top is pretty simple. 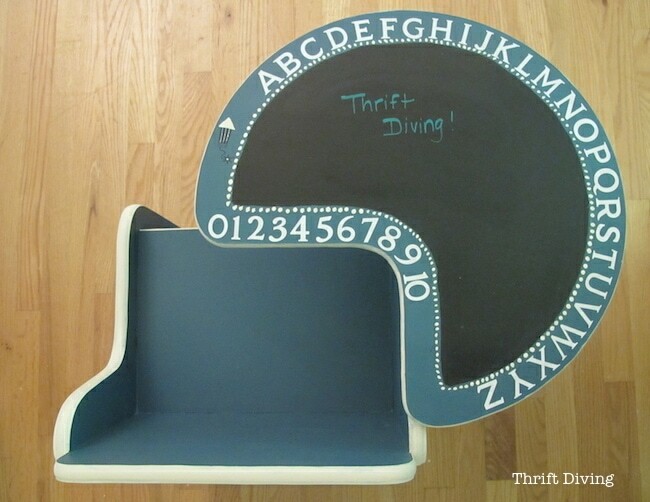 You just need some chalkboard paint or the Rust-Oleum chalkboard spray paint. 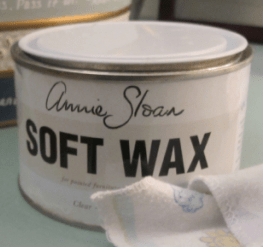 I prefer the spray-on kind, but in this case, it was easier for me to use the brush on chalkboard paint since I didn’t want the whole top to be covered in spray-on chalkboard paint. You’re also going to need some sheets of alphabet stickers. If you’ve got a Silhouette Cameo cutting machine (I love mine! ), you can cut out vinyl letters. But not everyone wants (or can afford!) to drop a few hundreds on a Silhouette and accessories. Cheap letter stickers work well, too! :). After I placed the alphabet stickers, I used Annie Sloan Soft Clear Wax over them to seal them in. 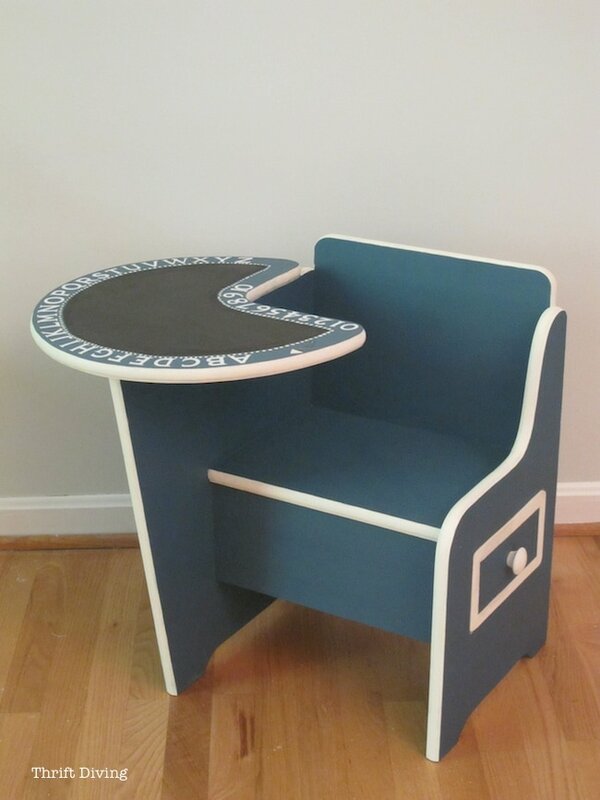 Have you refinished any desks for kids? What kind of designs/styles did you go for? That chair is so dang cute ,we have a 3 year old grandson and a new granddaughter, the 3 year old would love the chair and I might be able to keep him in one spot for awhile, now I will be on the hunt for something similar ,you did such a great job ! 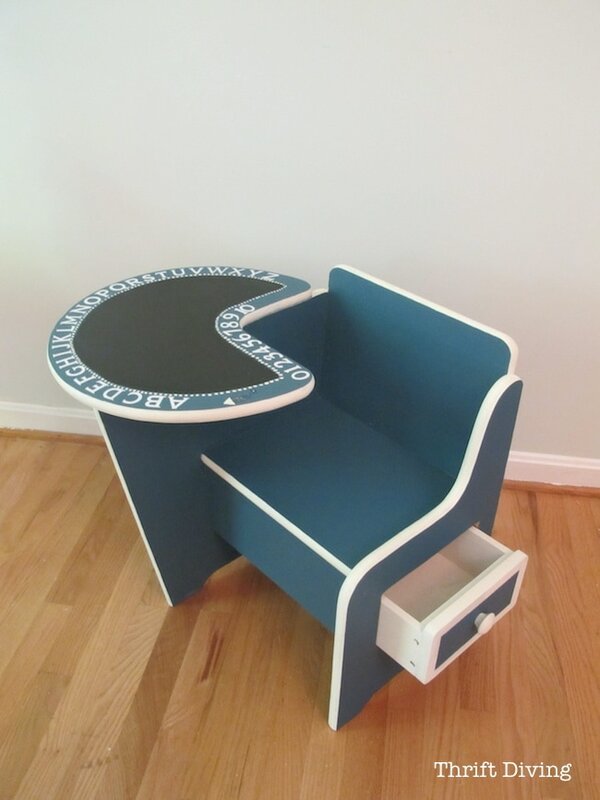 Refurbishing kid’s desks is a good option to rejuvenate the decor of your little one’s room. 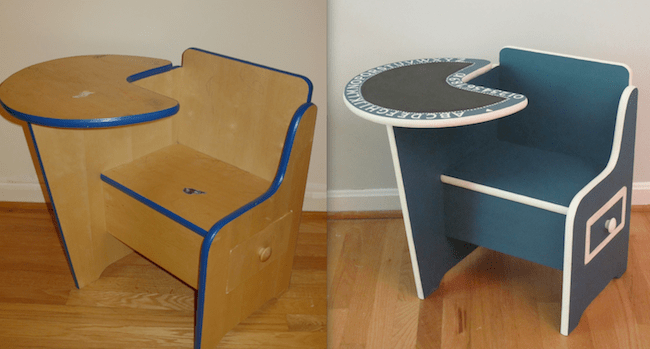 And the refurbishing options showcased in this blog by Serena Appiah is actually amazing and fit for every household and any given theme for your kid’s room. My baby isn’t even born yet and I would have snatched that up!!! Such a great deal! And you did an awesome job on it! High 5 on that one! You did an awesome job! I love this! 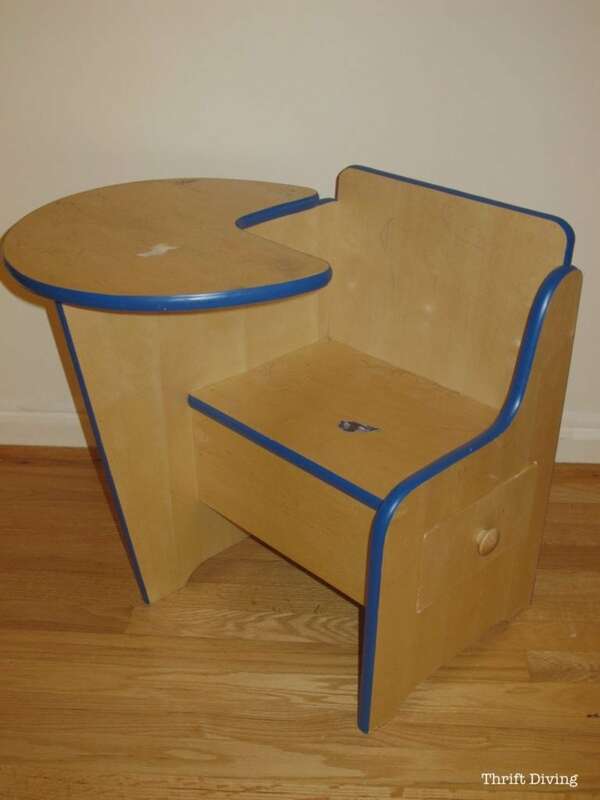 Every child would want to have this cool chair! that is the cutest little thing! love your little guy’s tan lines on his cute little feet!! Love, love, love this! 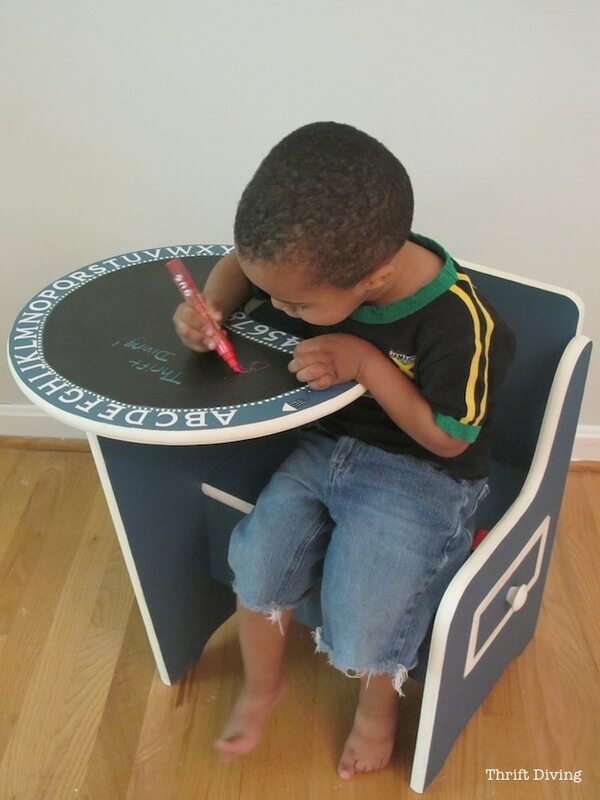 The blue and white are striking, and I love the chalkboard and chalk storage!